BRUSSELS (Reuters) - European Union governments are exasperated by British dithering over quitting the bloc but have little appetite for pushing it out on schedule next week without a divorce deal, senior figures said on Tuesday. EU ministers in Brussels to prepare a summit with British Prime Minister Theresa May on Thursday voiced frustration after the speaker of parliament threw up a new obstacle for her plan to get her Brexit deal ratified before the March 29 deadline. 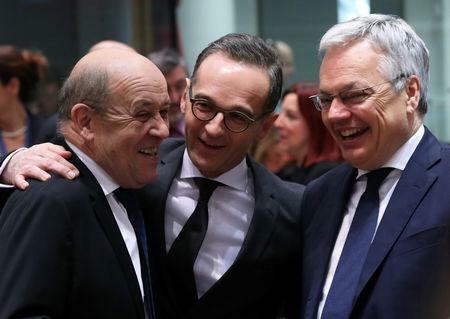 "Our patience as the European Union is being sorely tested at the moment," German Europe minister Michael Roth told reporters. "Dear friends in London, please deliver. The clock is ticking." 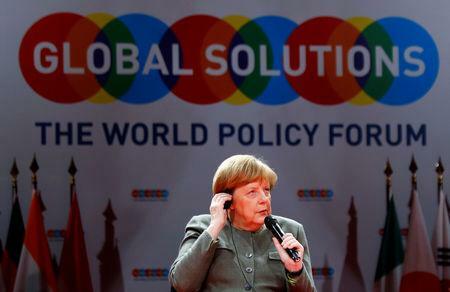 But Roth also echoed comments in Berlin by Chancellor Angela Merkel, the EU's pre-eminent leader, who said she would "fight to the last minute" until midnight (2300 GMT) on March 29 to ensure an orderly exit for the EU's second-ranked economy. He said Germany's main aim was to avoid a no-deal Brexit, which would disrupt business across the continent. However, after two defeats for the Withdrawal Agreement that May negotiated with the EU, and her difficulty in trying to get it through parliament on a third vote even before the speaker ruled that it must be substantially changed, it is not clear how May can avert this without asking fellow leaders for more time. Leaders expect to discuss such an extension at the two-day summit starting on Thursday afternoon. But if May has yet to make a concrete proposal on her next move then, then the summit can do little more than outline possible steps -- such as a readiness to give her a couple of months, or maybe longer. "If there is no move from London, the leaders can also decide to wait," said Belgian Foreign Minister Didier Reynders. "It really depends on what May will say at the summit." Diplomats said member states were still discussing options for extension -- possibly only for two to three months, if May persuades them she can clinch a deal at home, or for much longer if May accepts that radical reworking is needed. But these would come with conditions and might not be agreed until next week. Merkel said there was "far too much in flux" to forecast the outcome of the summit, but her foreign minister, Heiko Maas, told reporters in Finland: "If more time is needed, it's always better to do another round than a no-deal Brexit." EU diplomats say it is highly probable that leaders will unanimously support some sort of extension rather than see Britain lurch out of the bloc in 10 days' time -- even though some governments are starting to argue for ending the uncertainty and trusting to arrangements already put in place to mitigate the effects of a sudden, immediate exit. Aides to French President Emmanuel Macron, a powerful voice on the Council alongside Merkel, say the onus is on Britain to say what it would do with more time. "This uncertainty is unacceptable," his EU affairs minister Nathalie Loiseau said in Brussels on Tuesday. "Grant an extension? What for? Time is not a solution, it's a method -- if there's an objective and a strategy. And it has to come from London."